There’s been a lag in my blogging because I’ve been too busy doing to catch up with writing. Let me try to sum it up. 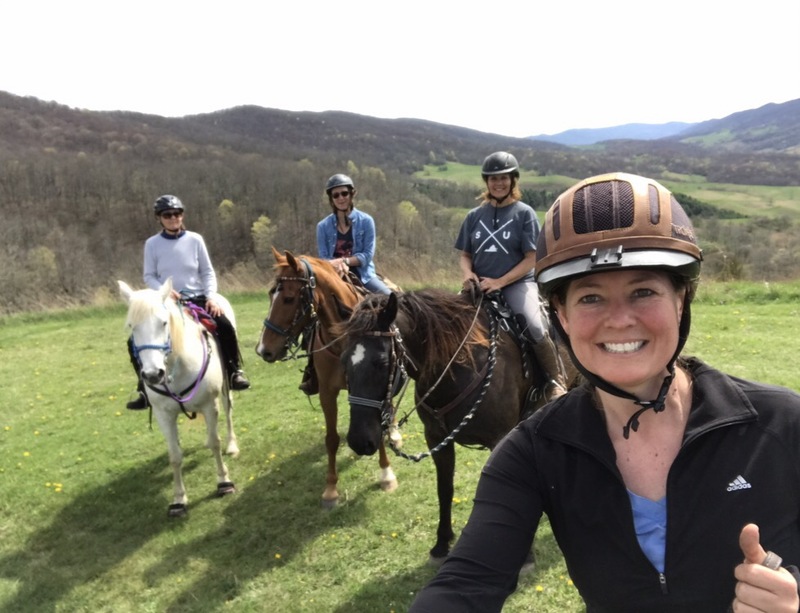 We hosted a two-day private horsemanship type clinic together with friends (horsemanship seems the closest tag… it was about everything from riding to energy work to nutrition to training to equine communication to life lessons… all jam packed into two intense days). My mom spent some time with fabulous Faygo as the plan is to send her to Reno this summer. Then after dropping the clinician and my mom at the airport I came home and packed and left for the No Frills 55 which we rode on Saturday. With a day to unpack and recover I’ve spent two days digging out of that hole from work duties and teaching my violin students. Now to update my blog as best I can considering how much material I have and how little time and space I have to write this week. I am so grateful for the time we had together to share horsey-life. We got some beautiful riding in my favorite spots including Hidden Valley and The Big Lonely. No! not even a little. 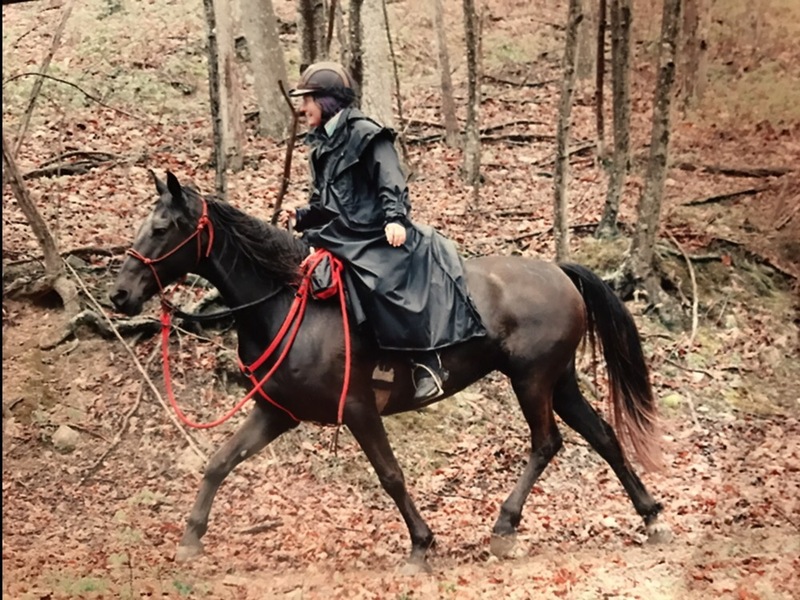 Of course I’ll miss her- she’s an amazing horse and my first love… but when you see something so right and the situation so great for her, that is the only thing that really matters. It makes my heart happy to know she’ll be with my mom and Shine. I can’t even begin. Life changing is an understatement so I’ll start by saying that it was a special time with women who are very important in my life and horses that connect us all. 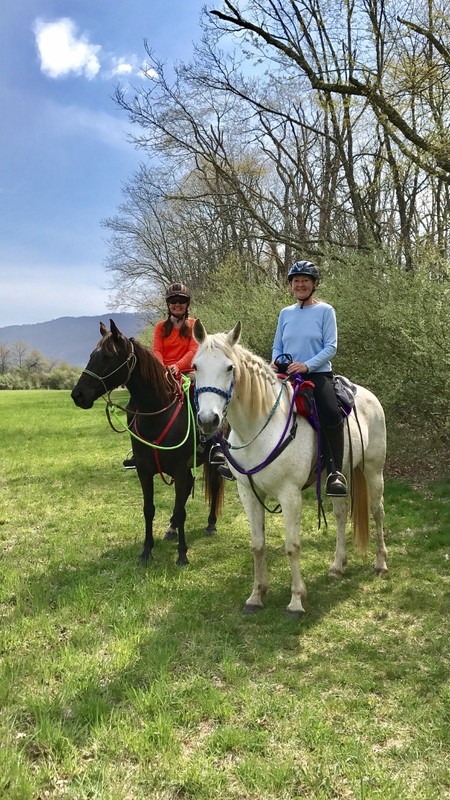 Dee from Simple Equine Teaching guides the humans to be able to think like a horse does because horses cannot think like a human. Seems easy enough- but my experience is that most people who try to see the world from the horse’s perspective mostly end up thinking “as if the horse thought like a human” and that’s where things go wrong. 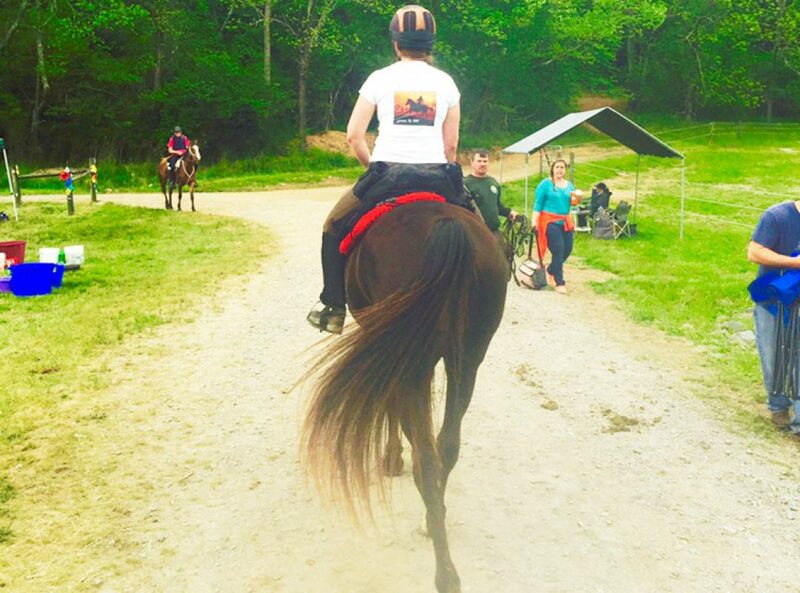 In order to see from the horse’s perspective first you have to notice how they communicate and enter that space. No matter what it sounds like from the outside- I’ve seen it. I’ve seen things change. Seeing is believing for me. It’s the kind of clinic that even though looking back the least amount of time was probably spent with me and Khaleesi within the total group, I learned a ton from being part of everyone else’s process. 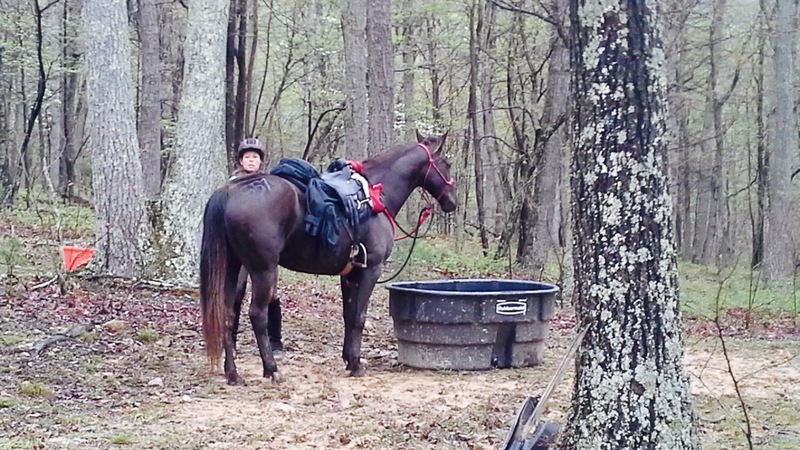 I don’t just want to know how to connect with my horse- I want to learn how horses think and communicate period- so watching very basic things between my mom and Faygo… and standing at the top of a very large field while Carrington learned to connect to her lead horse in a herd was invaluable for me. I learned much about working with Wild Heart and what that process will continue to look like and how Susan and I compliment each other with her… and had a blast with the time I did spend with Khaleesi. Spending some time with the girls at the Big Lonely before the clinic. The funniest must be when I went to collect my horse from the home field on day one- she would be transported to The Big Lonely (site of the clinic) after working with Wild Heart. My fantastic horse that comes to me and puts her head in the rope halter 95% of the time knew Dee was there and put on quite a spectacular show! 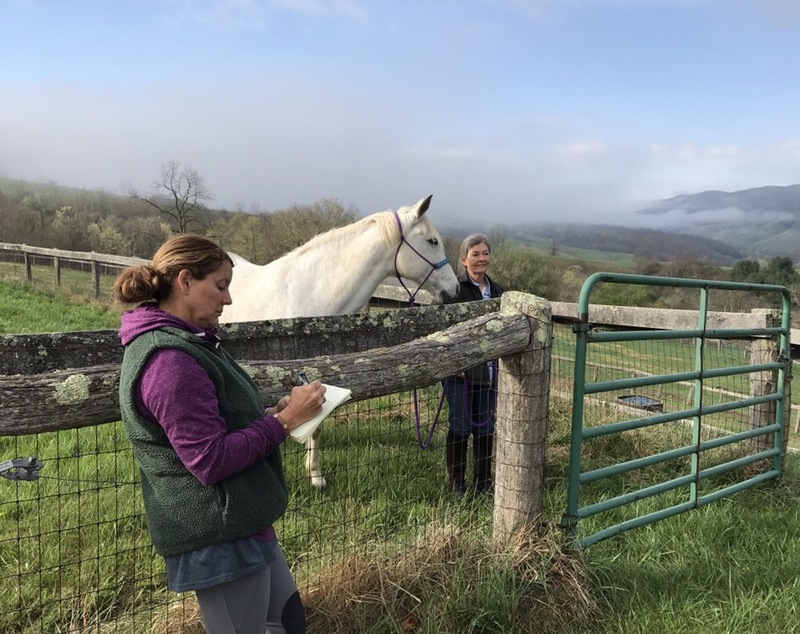 I kid you not: as I stood up in the barn hardly able to contain my excitement and anticipation to work with my partner I looked out the barn window and watched as she went from standing in the closest corner watching the barn to a full gallop down the fenceline to the farthest point of the field. Doubt if you want to but it was as obvious to me as the fact that the sun will rise tomorrow: she felt my energy and ran with it. I went out to the field and she came barreling back toward the gate. It had been raining on and off and the field was soggy. She showed off her full acrobatic repertoire. Bucking, rearing, jumping and running with sliding muddy stops. At one point before I stepped inside the field she did just the right amount of twist to send a shower of mud particles cartoon-like in their perfection showering right on top of me. Yes. She dared me. Come in to get me! WHEEEEEEEEEE! If she truly wanted to evade she had acres of field to leave me for but instead she played with me and danced showing off her skills and then standing still enough for me to get close, offer a hand then twist and buck and run off again. K: You need to up your game today! Dee is here… I know it! Me: Show off. Come in and work with me. I promise it will be fun! K: I will… but you have to say the secret code first! Me: Come on… you know I don’t know the secret code. K: I know… but Dee does! You might figure it out here… I’ll give you clues. True enough Dee finally came outside as the game went on and laughed: I love this mare… she is having so much fun with you! 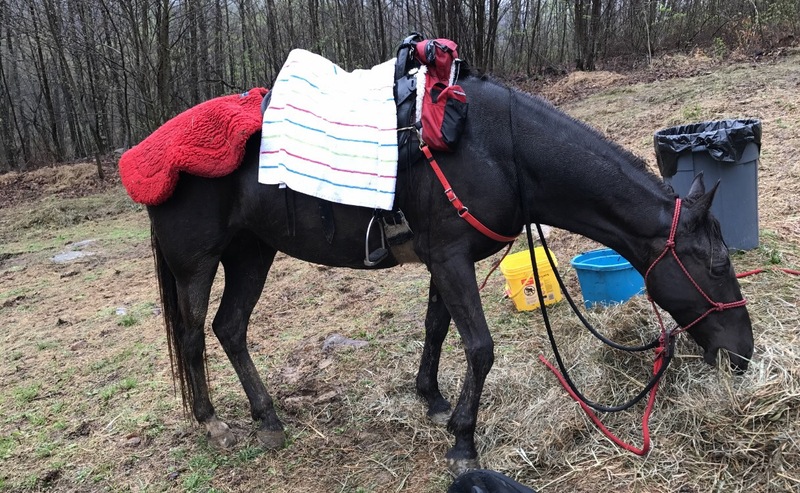 After a couple suggestions revealing her equine code of the day, true to her word K stood still and dipped her head into the halter and we left the field together and into the trailer heading for the Big Lonely as if nothing was different than usual. She wasn’t worked up or hot or distracted- she had her fun and was mine again. 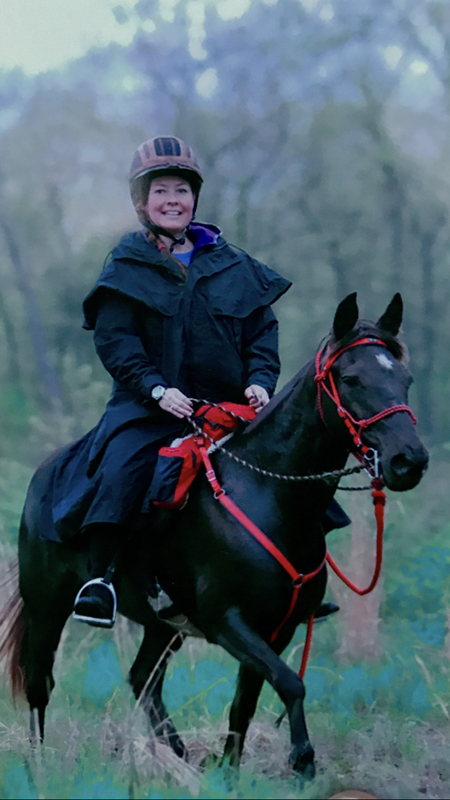 As the rain kept coming on and off we rode in the indoor arena there and talked about diagonals and signals of riding that are just a little different than the things I’ve heard around me for years. 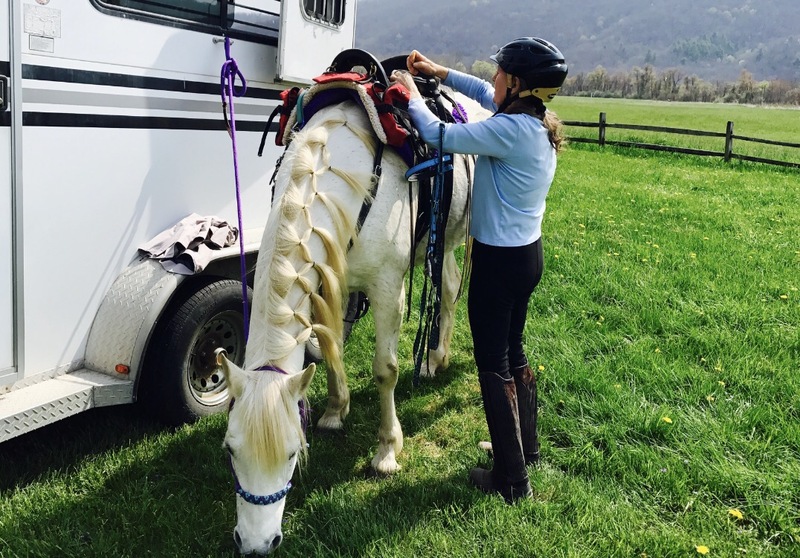 I brought up my experimentation with riding in the halter and she thought a moment before suggesting that it’s ok with the right equipment but not ideal… what we need to set our sights on is to ride in a neck rope. After all when doing 50 – 100 miles on the trail, getting everything off her face would be best. Not today…. But we’ll get there. Of course we will. I have no doubt. After dropping my mom and Dee at the airport Friday morning and not being sure my truck was ready at the shop I was completely unsure if I’d be attending my favorite ride this year. I have been learning that all of life is beyond my control and that it is OK. I am learning the strength in flexibility and how to pay more attention to the doors that open around me. If my truck wasn’t running it didn’t matter how ready my horse was- the No Frills wouldn’t happen for us this year. But my truck did get finished thanks Jay Ford and Casey and team and then I truly did have to make the call: do I go or not go? I was mentally and emotionally exhausted and hadn’t had much time at home. I had plenty to catch up on. This 55 on the other hand was a true test of green to 100’s current conditioning program and her feet. It was my last chance until June to see if we were on the right track. After a brief discussion with Ed (who was working over the weekend anyway) I decided to go. I packed in an hour, loaded my horse and hit the road. I didn’t put my usual ton of thought or preparation. I threw some things into a cooler, a bag and a few plastic bins. As long as I had horse and saddle I should be fine. The biggest things I forgot were: sleeping bag, GPS and heart rate monitor. I was able to borrow a blanket from great friends Amy and Ricky and Amy even leant me a HRM but I couldn’t make it work. Didn’t matter. This ride there was no data- and that was for the best. I woke up at 4:30am in my trailer hammock to pouring rain and figured I’d made the wrong call. I should have stayed home. Too late. I’m here, I drove. I paid. I’m riding. Thankfully the Muddy Creek Rain Coat Ed got me a couple birthdays ago created a climate bubble. I was never cold and never wet. In fact it ended up being quite a pleasant ride despite the high of 48 and cold rain. The weather was ever in Khaleesi’s favor. It kept her cool through a very tough ride, and it softened up some of the hard pack easing some of the concussion of 55 miles. I went out of camp last knowing the only way we would make it through sound was to let her pick her way through the rocky trail at her pace. I had no way of knowing our average speed thank God because it seemed too slow to finish, but I didn’t care. 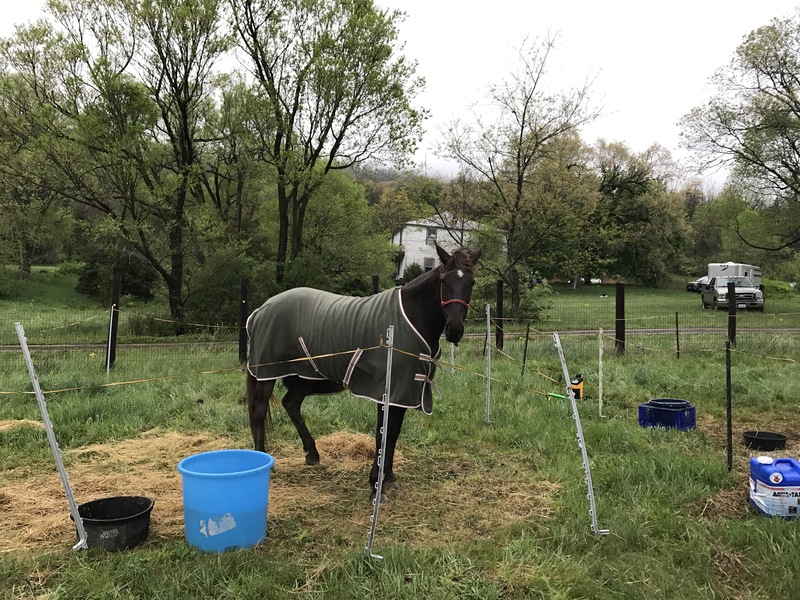 My horse came first and I would not make the same mistake I made at 2016 Iron Mountain. I would listen to her and allow her to navigate as she was able. If we went overtime so be it. This time I would listen. I would make it up to her. I would be better. We met up with Roger in the first loop and the two of us never left the last positions for the entire 11 hours we were out on trail. Khaleesi crept through the rocks and trotted whenever she could. We didn’t hurry and we didn’t tarry. By the last vet check we were alone after about 10 minutes into our hold while the volunteers began cleaning up- no one was even close to our last places in line. Didn’t matter- my horse looked amazing. 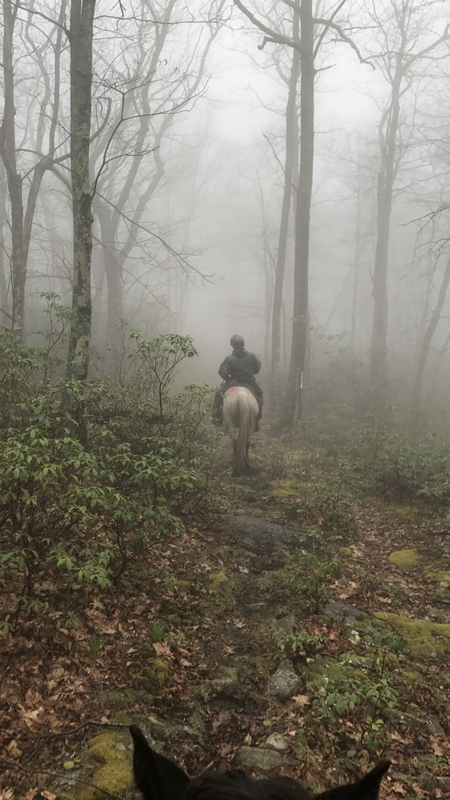 The final 10 miles to camp we rode alone and the footing was normally hard pack but the relentless 10 hours of rain had softened it up just enough and she trotted and cantered that stretch like we’d just left the barn. The road follows a stream; she dragged me in a few times to drink her fill and she would pick at the lush early grasses from time to time but overall she ran home with energy to spare. We all but cantered excitedly down into the final vetting in camp and once I pulled her tack she pulsed at 60 then had a cardiac recovery of 48 bpm. Fantastic! I’ve never seen her look so good after a ride and her feet held without a sign of lameness. What a good lesson for me. The No Frills is hands down one of the toughest rides for both the 30 and the 55- thankfully in April we never had the heat & humidity the June OD ride does, and the June ride has more elevation gain to worry about, but this ride has the worst rocks of all three and intense relentless trails. As Roger reminded me: You close your eyes at night and see rocks after this ride. Grass & rocks, mud & rocks, big rocks and small rocks; embedded trail rocks and loose gullies of rocks. Rocks everywhere you turn. Something else Roger said that gave me a smile. 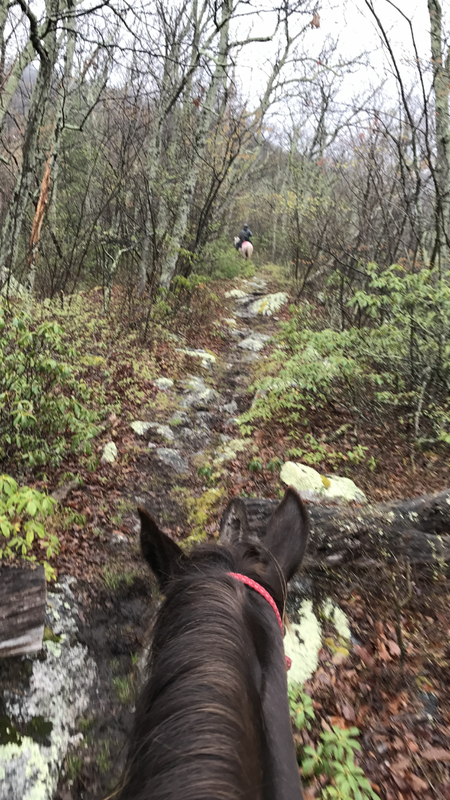 He said Khaleesi moves so beautifully- like she floats down the trail but you can see her put that hind end motor underneath herself with great power. That’s what I want. Power and ease. I have a long way to go as a rider to help make her job as easy as possible, but I have come such a long way from my first LD on her with my legs flying around and being tossed into the air feeling like I’d gone through a washing machine for 30 miles. Overall this past year has been a challenging one on many levels. Often uncomfortable, but it’s the challenges that up your game and make you better if you let them. It’s the fire that refines. With many lessons sloshing around the think tank I will enjoy a moment of positive growth. Here after this 55 I think we both looked and felt the best after a big ride yet! 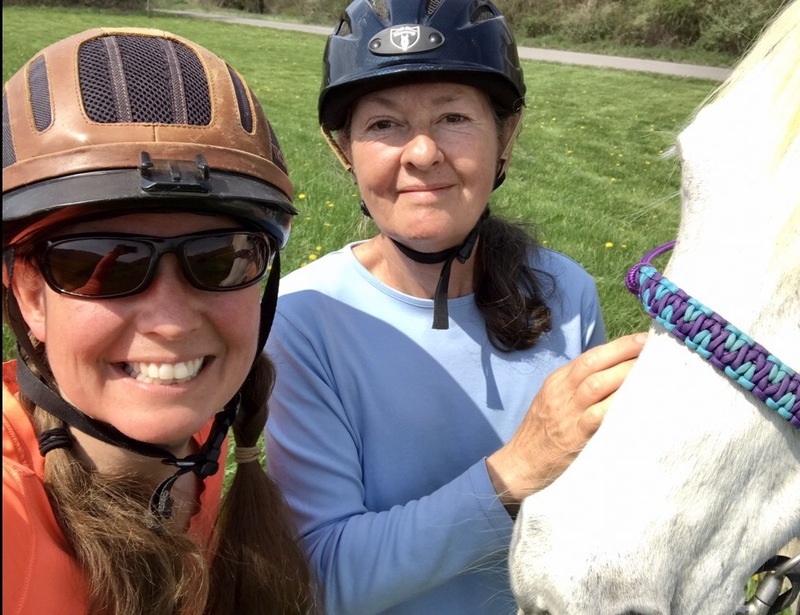 I am refreshed from some time with my amazing mom, and my horse and I are on the right track and have many more years and miles to tweak and improve. Congrats on completing such a tough ride. I’d have been miserable in that weather. You look good out there.